Norwegian Offers Free Cruise with Purchase: Is It Worth It? Norwegian Cruise Line has launched an eye-catching new offer — buy a seven-night cruise and get a shorter cruise for free. 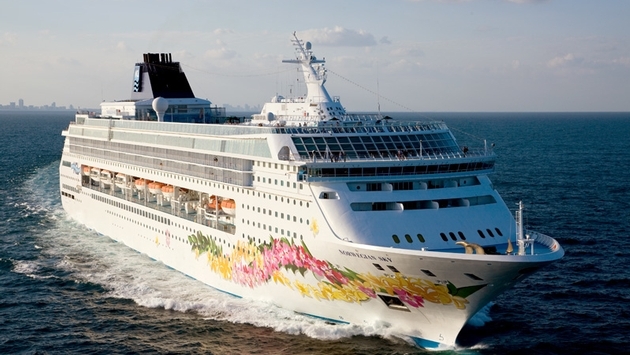 Here are the details: Book a seven-night cruise on one of the line’s two newest ships — the New York-based Norwegian Breakaway or its Miami-based sister, Norwegian Getaway — and get a free three- or four-night Bahamas cruise on the older Norwegian Sky from Miami. The week-long cruise must be booked April 30 through May 11 on cruises operating from May through September. Then, the buyer gets a second, free short cruise on the Norwegian Sky (pictured above) on select dates — Sept. 5-Nov. 21, Dec. 1-Dec. 15, and Jan. 2-Feb. 27. (Norwegian’s website shows fares on Norwegian Sky start at $159 in November.) The second cruise is non-refundable and non-transferable, which means a parent couldn’t take the longer cruise and give the short one to a child. The deal is good on Norwegian Breakaway cruises to Bermuda and the Getaway to the Eastern Caribbean. Fares start at $449 per person, based on Norwegian’s website. Some travel agents said the offer is especially welcome since consumers accustomed to Buy One, Get One — or BOGO offers — in retail stores might be drawn to check out a cruise for the first time. “This new offer from Norwegian Cruise Line is in line with the cruise industry’s ongoing focus to attract new travelers to cruising,” said Michelle Fee, CEO and co-founder of Cruise Planners, an American Express Travel Representative. “Inviting new cruisers to experience the Norwegian Breakaway and Norwegian Getaway will help promote cruising in general, which we support. Drew Daly, vice president of sales performance for travel agent networks CruiseOne and Cruises Inc., agrees. Still, as with any offer, consumers should read the fine print. “It’s really good marketing, but the devil’s in the details, as they say,” said Steve Cousino, owner of Journeys by Sea in Madison, Wis. “It’s a great way for Norwegian to fill space during less popular times, and I think it will be a good way for folks with a lot of extra time to get more vacation. "The biggest issue I see with it is the Norwegian Breakaway dates are this summer and early fall 2014, and the shorter cruise on Norwegian Sky is later in the year and early 2015 (excluding holiday sailings). For many people, that will be difficult to swing — two periods off work that close together, plus the expense of getting to the ports and all that that entails (especially if airfare’s a consideration). This type of deal is not unprecedented. Princess Cruises made a similar offer on short cruises out of Los Angeles and Fort Lauderdale late last year. The line offered a 50 or 100 percent future cruise credit, based on the fare paid for a three- to five-night voyage. Norwegian’s deal is obviously a more attractive option for, say retirees living in South Florida, who can cruise once on the Norwegian Getaway and have the time for a second cruise shortly thereafter. Plus, they can drive to the port.